Propsummit.com a Blade Runner Prop Community Forum BladeRunnerProps.comView topic - Full-sized Spinner? Posted: Mon Sep 19, 2016 1:48 pm Post subject: Full-sized Spinner? Has anyone attempted or been successful building a full-sized drivable replica spinner? -Is there enough information available to do so? -Is Gene Winfield still in SoCal and active/available for questions? 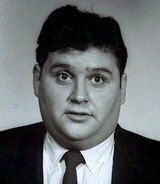 -Is he conducive to offering advise? -What car was the shell built on? I ask this because, due to a variety of circumstances, I may have the opportunity to try a project like this, and as is my nature I try to research things as much as possible first. 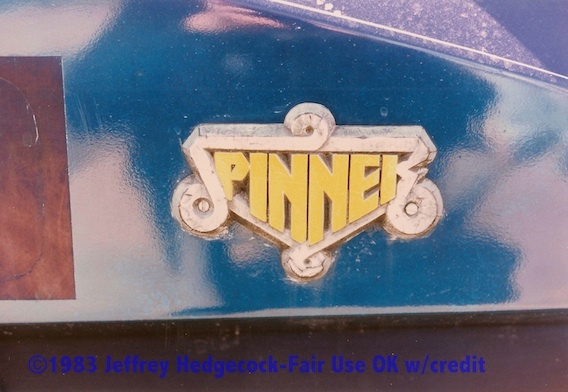 Back in the mid-'80's I had an opportunity to see and photograph one of the blue spinners when it was at Fantasy Cars in El Cajon CA. Seeing the car in person struck a chord with me and I've always dreamed of building one. At this stage of my life I feel I have the skills to attempt a project like this, so want to scope it out. So gang, and learned resources here........whatcha think? Have dreamt of starting such a project for years, the more you think about it the more it seems possible but then falls the shadow so to speak and you realise how big a deal it would be. There`s always someone though that breaks through and does the improbable. Fully support your idea and feel free to ask for any help, as with many here would love to see someone actually do this. I`ve got one section sorted out for you when the time comes. If I'm not mistaken the chassis (base) was a VW Beetle. Plenty of pics on line, video on Youtube and behind the scene on the DVD. Gene is still in SoCal and re-built a Spinner for the Sci-Fi Museum in Seattle. I'm pretty sure that he wouldn't mind the question from another bloke wanting to do a Spinner. Sci Fi museum in Seattle not sure if it was drivable or not though. Those guys might be a good place to start. From his photos, it's like he found one of the background cars and turned it into a hero for the display. I wonder if that's why it's up high rather than being nearer the viewers. I've done some looking up on gene winfields' current activities and it seems he's doing some teaching etc. Hes only about 3-4 hrs north of me so sounds like I should look him up for a visit. Anybody here have interaction with Jay Rohrberg or Gene? Gene has a pretty poor website, but it does have a link to his interview in Bladezone. Roll down to the end of the menu on the left side. 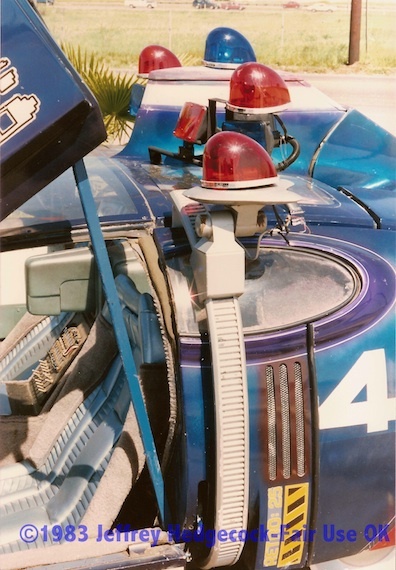 As I mentioned above, I took some photos of the "44" spinner when it was in El Cajon CA back in about '83. A friend heard that it was there, so we drove out and saw it. Turned out there were two other vehicles there, the white sedan and another spinner, which could have been the process car or the aluminum flyer. 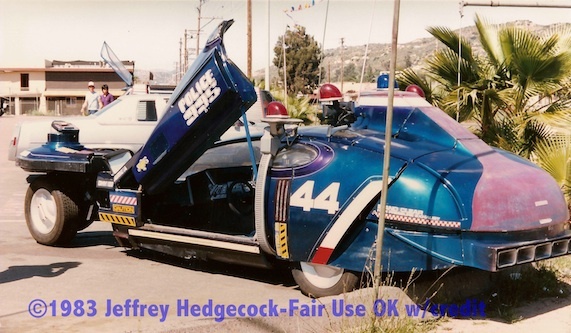 Further research says that the place these were at was Bob Butts' place, Fantasy Cars. It was just a unit in a strip mall, and it seems that unfortunately Bob is no longer with us, so I expect the place has long since been closed. It was after all over 30 years back. I'm ok with folks using these photos, but PLEASE CREDIT ME. I have 20 photos in all, which I just scanned last night, and I'll try to post more soon. I think these could be very valuable to spinner fans, as they show the spinner in "un-messed-with" condition. It seems from the reading I've been doing on BladeZone, etc that the 4 or so spinners made have undergone lots of mods and bodges over the years, almost none of which are accurate to the show. TFS with us hauptmann Really cool to see those pics for sure! As you can see in the pics (Jay), you clearly make the engine of the VW at the back of the car (would be easy and fairly affordable to get one). Eager to see the rest of the pics! He's 89 - better make that visit sooner than later. TM- That's good advise. I figured he was up there, so the urgency is appropriate. 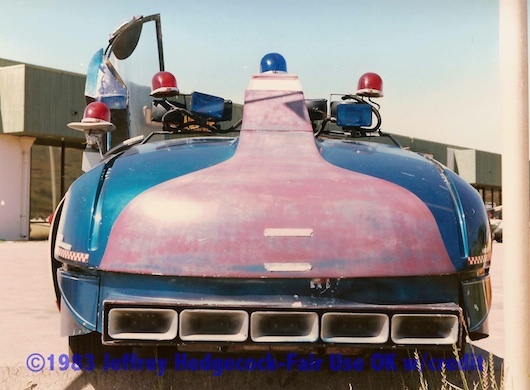 My general idea is to connect with those involved with the production of the vehicles, probably specifically the spinner and possibly the sedan, and see if any of the fiberglass mold tooling survives, or at the least some of the engineering drawings/blueprints. Perhaps get a crowdfunding scheme going to fund it, mostly to facilitate using as many of the original people as possible in the creation. I think they'd do the most faithful job considering their involvement in the original production. I'm not sure there's enough material out there to create a truly accurate replica without the original creators involved. At the least, my hope is to exhibit the result, and credibility would increase a lot with Gene et al involved in the project. I'm just laying groundwork for the time being, with fingers crossed. Does anyone have any thoughts or suggestions? Has anything like this been attempted, other than the Jay Ohrberg "reconstruction" for Seattle? I'm open to all help. This would be my dream project if I had the money. My brother has all the skills to do it, he builds motorcycles, he is great at mechanics, welding and fiberglass. All I need is to win the lottery. Met Gene yesterday at his annual hot rod show at his shop. So glad I made the 3 hr trip. Cool guy, event and place. Don S. who was involved in the original car builds and the '04 restoration has been great in helping move things forward. Took the "tour" through Gene's house/museum....really cool....and awesome that he opens his home like that. Not sure where my project's going yet, but it looks promising. More details as things progress. Just exploring the potential and possibilities at the moment. 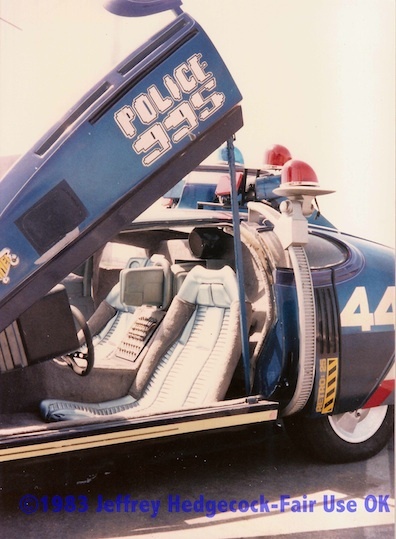 If you stumble across the book about Gene's movie and TV car work, get it. It's great. There was a book about George Barris' car work at the show....also worth checking out. Great to hear that you've met The Man and Don...I'm sure that by now, you know that building a 1:1 Spinner is not for the faint of heart. But if you succeed, that'll be the best prop ever on Propsummit.